I keep flinching and slapping at the invisible bugs that land and leap away so fast I can’t tell sometimes if they are real or merely a figment of my imagination. By the time I slap my arm, they are gone, and all that lingers is that faint distant tickle on my skin. Craig peers up at me over his little wire glasses. We are wading through 25 years of radio-collaring lion data and I am playing the dusty, bugbitten, in-desperate-need-of-beer secretary. He gives me a withering stare as I twitch murderously at the bugs that seem to molest only me. “It’s all in your imagination,” he says with a playfully dismissive wave of his hand as he hunches back over the dusty files. Seething in indignation, I am finally successful in my arthropod assassination attempts and throw my tiny offender at my academic advisor. “I don’t want your pickings!” he squawks. Merciless, I catch another and drop it in his lap. Satisfied, I resume recording. I think the bugs are the only thing I dislike more than the baboons that crap on our veranda. The ants recently invaded our drop toilet (the only one in town where you still have to squat), milling about on the concrete slab in typical ant frenzy. African ants seem to be generally unstoppable. They swarm across our kitchen countertop so thick that the white laminate is completely obscured. Yesterday I saw them dragging a dead tsetse fly across our windowsill. They are tiny pinprick ants, so ghostly as they crawl across your skin that you’re never quite sure if you’ve merely imagined them. But we don’t imagine them in our food. They are baked into our bread, spooned into our leftovers, drowned in our drinking water…They even invaded my canister of refrigerated Lindt chocolates. They flail hopelessly in our wash water and get stuck in the little holes of our makeshift shower bucket. I think sometimes they bite – the backs of my legs are covered with little red itchy bumps, and if they aren’t ant bites then they might be tick larvae, which is even more disgusting. As much as I would prefer not to share my shower with a thousand tiny freeriders, I have this strange love/hate/admiration/disgust relationship with the colonial creatures. Philipp tells me how some ants raise aphid “livestock,” carrying their little aphids around to leaves and then milking them of their leaf-juice. Some ants live in little black balls on the whistling-thorn Acacias and attack hungry ungulates that dare to browse on their branches. One day while scouring game trails for fresh carnivore sign, I discovered a series of 4-inch wide paths that wove between the trees. I turned to the camera trapping guru by my side, the funny German who’s spent the last decade in the remote west-African bush. Ants! 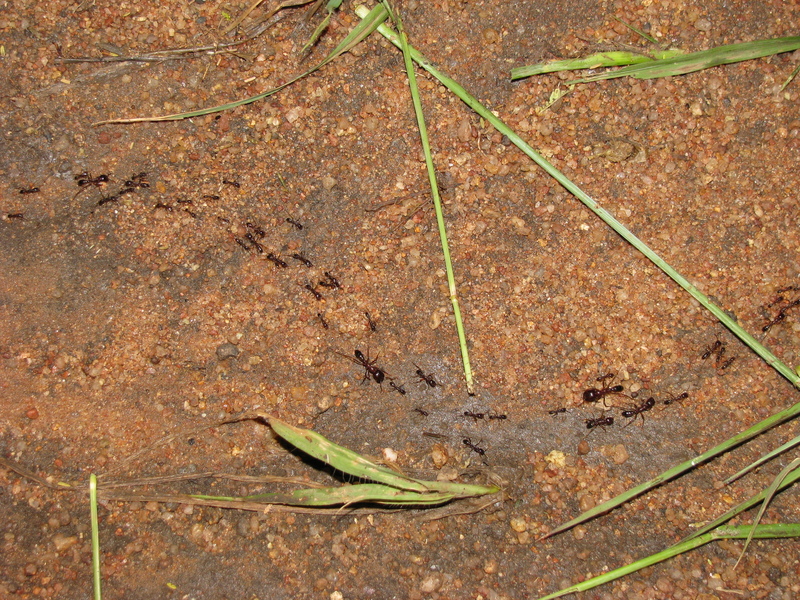 Philipp says.Yes, the ants move in such volume that they create barren little tracks through the woodland grass. Sometimes we can see the ant army marching in rigid formation outside the Lion House. They appear out of nowhere against our cinderblock corners and trudge across the dirt. I don’t know where they are going, but they look like they’re on a mission. Perhaps they heard that there was something in the outhouse.